What are the terms you use to help students differentiate between higher-level questions and lower- level questions? 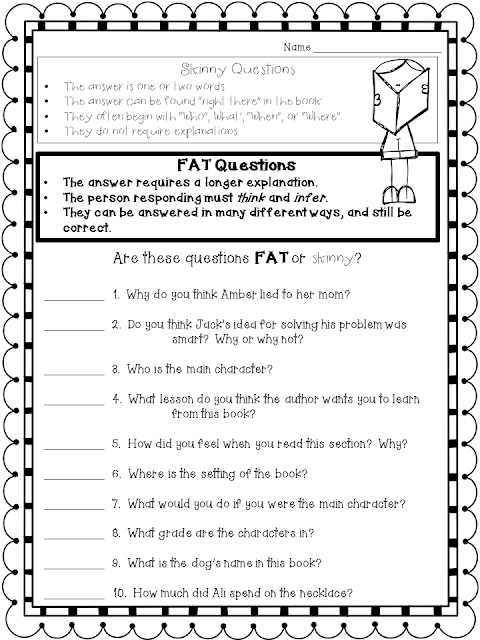 I use the terms "fat" questions and "skinny" questions with my 4th and 5th graders. I know many teachers use the terms "thick"questions and "thin" questions, and I tried to use these terms for multiple years, also. However, I quickly realized that these terms were too confusing for my ELLs. I drew pictures and used hand gestures, yet many still had trouble remembering which word was related to higher-level questions, and which words were related to lower-level questions. Finally, I switched to using the terms "fat" and "skinny" because I knew that everyone had a solid understanding of what the terms mean exactly. Once I made this change, my students were much more confident in the questions they were writing because they knew that they were fully understood the concept. 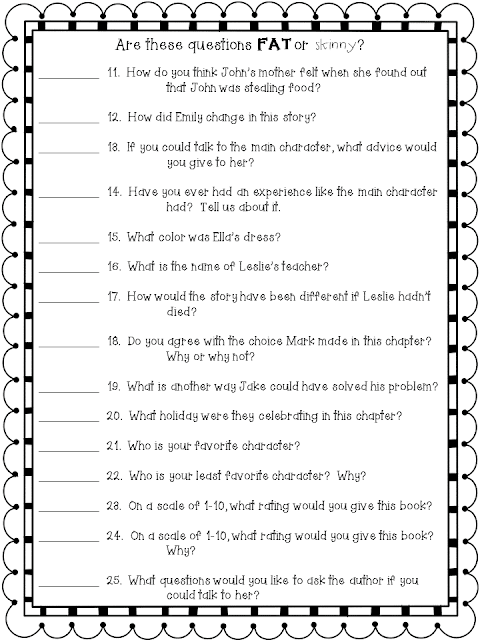 I found that it worked well to use this worksheet as a lesson before we introduced literature circles for the first time each year. Then, when it was time for students to write their own questions in preparation of their literature circle discussions, they did a great job asking deeper questions! If you are looking for a worksheet that will help your students differentiate between higher-level and lower-level questions, feel free to download this for your students! Once again you have created a terrific resource. This is a wonderful way to practice this concept. My kiddos struggle so with it. I'm anxious to use this with them. I know it's going to help them a great deal! Thanks for sharing. I'm so glad that you will think it will be useful for your older students, too! Thank you for the awesome resource. I will definitely use it next year!